CRAZY COOL GROOVY!!! : #BLACKWOMANMAGIC - ATLANTA, BATON ROUGE, CHARLOTTE, & NEW ORLEANS NOW HAVE BLACK WOMEN As MAYORS!!! #BLACKWOMANMAGIC - ATLANTA, BATON ROUGE, CHARLOTTE, & NEW ORLEANS NOW HAVE BLACK WOMEN As MAYORS!!! 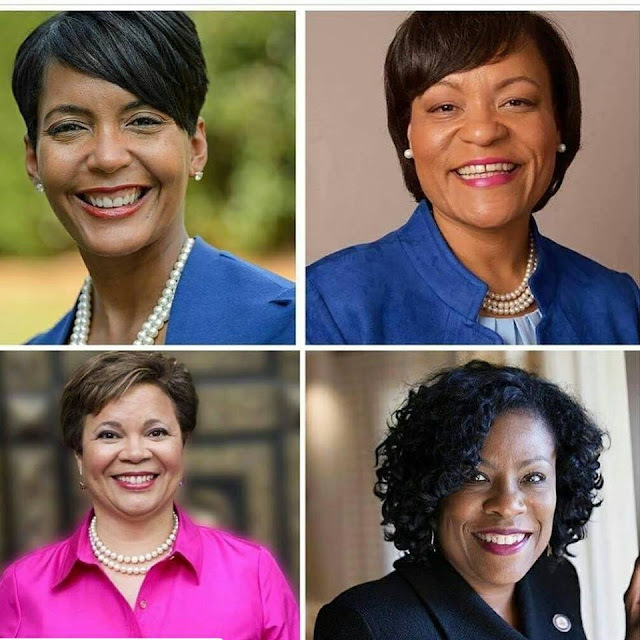 CRAZY COOL GROOVY CONGRATULATIONS goes out to (clockwise from top left) KEISHA LANCE BOTTOMS, LATOYA CANTRELL, SHARON WESTON BROOME, and VIOLA VI LYLES for making BLACK HISTORY and BLACK HERSTORY by being elected MAYOR of their respective cities of ATLANTA, GA, NEW ORLEANS, LA, BATON ROUGE, LA, and; CHARLOTTE, NC!!! HAPPY BLACK WOMAN MAGICAL MAYORS SATURDAY!!! Join us this evening for the volunteer kickoff at our campaign headquarters (The Park Expo) from 6 p.m. to 9 p.m. Meet me and learn more about how you can help!